Master Lock is recognised around the world as the solid, enduring name in padlocks and security products. Founded in 1921 Master Lock continues to build upon its founders spirit of innovation, quality and good value for consumers. As the largest global manufacturer of padlocks, Master Lock continues to build quality and value into its expanding categories and ranges. All Master Lock products with a locking mechanism also have a Lifetime Guarantee against mechanical failure. Master Lock has manufactured padlocks since 1921. The range includes an extensive selection of body types and sizes, shackle lengths and widths, and keyed and combination locking options. There is a lock for every need and application in the range. Master Lock’s strength is in combining innovation, security and design to create a truly secure range of products. Master Lock’s best selling range of key lock boxes and convenient key storage products offer peace of mind for customers and businesses looking for practical key management solutions. Master Lock brings a new dimension to cargo security. Our exclusive product and packaging designs make buying and using cargo security easier, safer and more convenient for customers. Master Lock’s cargo security program offers a complete range of products including bungees, straps and ratchet tie downs. Master Lock’s range of 2 wheel bike locks have been designed by our dedicated engineering team and offer a complete range of security solutions to meet everyone’s needs. 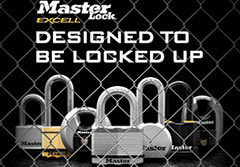 Whether you are looking for a cable or D-Lock, key or combination locking mechanism, Master Lock has the right solution. Master Lock has a market beating range of safety Lock out/Tag out products targeted specifically around employees safety in the work place that includes circuit breaker locks outs, electrical plug lock outs, valve lock outs, lockout hasps and lock out padlocks. For those looking for a complete solution Master Lock has a range of ready to go kits.